Dynamo Kyiv President Ihor Surkis has dismissed Dynamo manager Oleh Blokhin for unsatisfactory results. "FC Dynamo Kyiv President Ihor Surkis has decided to dismiss Oleh Blokhin as chief coach for the unsatisfactory results of the team," reads a statement posted on the club's official Web site. Blokhin signed a four-year contract with Dynamo Kyiv on September 25, 2012. Prior to that, he worked with Ukraine's national football team. Under his leadership, Dynamo failed to qualify from the Champions League stage round and pulled out of the Europa League in the 32-team round. After that, the team finished third in the Ukrainian Premier League and for the first time in many years was deprived of a chance to play in the Champions League. In December 2013, Surkis and Blokhin agreed to continue cooperation until the end of the 2013/2014 season. In late February 2014, Dynamo pulled out of the Europa League round of 32 after losing ion aggregate to Spain's Valencia. On April 16, Dynamo lost to Shakhtar 0-2 in Kyiv. 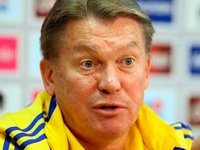 Blokhin said at a press conference after the match that he had decided to resign. Dynamo is now seven points behind Ukrainian Premier League leaders Dnipro and Shakhtar.